Shared inventory is the practice of selling the same physical room under multiple layouts. For example, the same physical room at a property could be sold as both a dorm room or a private room. How do I enable shared inventory for my account? Shared inventory is a paid add-on feature currently offered to certain property types. If you're interested in Shared Inventory, please contact our support team at support@cloudbeds.com to inquire about whether this feature is a good fit for you. Once enabled - how Shared Inventory will look in myfrontdesk? Are there things I need to be careful about with Shared Inventory? Yes. Shared inventory is a very powerful tool for maximizing revenue and occupancy. However, if Shared Inventory is not setup correctly, it can quickly cause overbookings. Follow the steps in the guides linked to below. What are some examples for how this can be used? Is it possible for someone to book multiple layouts of the same physical room? While there's always a risk of overbookings if you're selling the same room multiple times, our shared inventory helps to greatly reduce that possibility by automatically adjusting the availability for linked rooms, especially for group bookings within the system and made through mybookings. However, if two linked rooms are booked at the same time on an OTA, we're unable to adjust availability to prevent a guest from booking them both in the same reservation. Can I use shared inventory to split a larger room type apart into separate smaller rooms of a different room type? Yes, but only if is is split into units of the same accommodation type. For instance, you could split a house into two identical duplex units, but you cannot split a house into a king room and a studio. We're planning to expand this functionality in the future, however. For more info about how to configure this, you can read through an article on the topic here. Does myfrontdesk normally support shared inventory (without paid feature)? By default, myfrontdesk does not normally support this as the system will send the availability of each room separately. If you create different accommodation types for the same physical room on your myfrontdesk and/or OTA accounts, the possibility of an overbooking is very high. Without Shared Inventory, you will need to be very careful and manually adjust the availability in your calendar. Okay, well how should I normally map my rooms then? Great question! Take a look a look at our Distribution Channel Mapping Guidelines! How occupancy is calculated for Shared Inventory? How do assignments work with Shared Inventory? When you have shared inventory it means that one physical room is sold in multiple ways. For example, a single dorm room may be sold as a men’s dorm OR a women’s dorm, depending on which one is sold first. 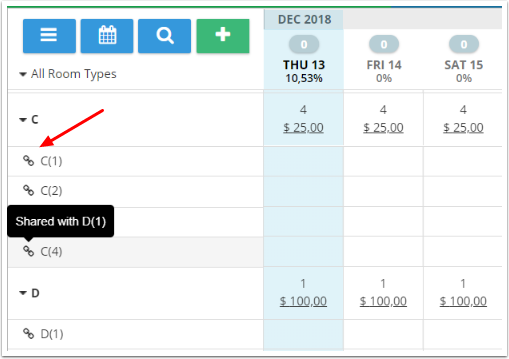 When one of these room types is sold one way, it can’t be sold the other way and the system creates a red “block” in the calendar - as a result, a user will not be able to assign a reservation to the blocked accommodation. Sometimes, when a property has very low availability, the user is unable to assign a guest to consecutive nights. In the event there are no consecutive open dates, the system will show a warning modal advising them on how to proceed with the assignment.